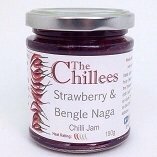 The Bengle Naga chilli is a fruity chilli and it intensifies the flavour of the Strawberry with the first taste. Then the warmth of the chilli slowly develops. Incredible with Goats Cheese or on a cheese scone, with cream cheese & a dollop of this jam, for a twist on the English Cream Tea, perfect with a glass of your favourite tipple. Simply delicious mixed with some Balsamic vinegar to make an incredible salad dressing. Scrumptious drizzled over warm bacon & feta salad.Even more decadent over an Eton Mess; oh yum! Ingredients: Strawberries (45%), Sugar, Lemon, Bengle Naga Chillies (1%), Apple Pectin.